Military telephone cable as the antenna wire. How big are the losses? Measuring attenuation of DL1000 military telephone cable. Common mode measurement of DL1000 telephone cable. Does anybody want to join an effort to test reciprocity? This time we were back to the same hotel as 2014 in Puerto de la Cruz on Tenrife, but now in the later part of January. The hotel has 12 stories and last time we were at the 8th floor and it worked out very well. This time I asked beforehand for a room at the highest possible floor. That didn’t help so we ended up at 4th floor, the lowest with “Sea View”. There were buildings between the hotel and the sea and one was right in the direction of the US East coast. So the boost of “ground reflection” was very poor. 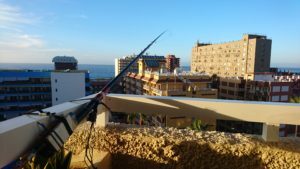 The set up was the same as earlier with the FT-817nd an automatic antenna tuner and the 5 meter long retractable fishing rod with a thin wire along its length. 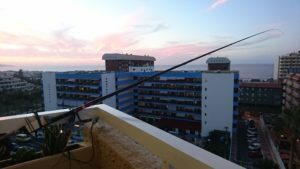 It was fed with 6.6 m of RG-58 and the railing of the balcony was used as a counter poise and was connected with a heavy battery clip. Part of the coax was coiled through a ferrite toroid close to the feed point. 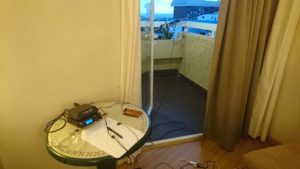 It was possible to tune the system from the 30 m band and up with less than 1 dB loss compared to a quarter wave whip on each band. That was measured by reverse beacon spots at home. For 40m I used a thin wire from the tip of the rod back to the balcony about one and a half meters away from the rod. Radio time was restricted to evenings since rest of the day was filled with typical vacation activities. 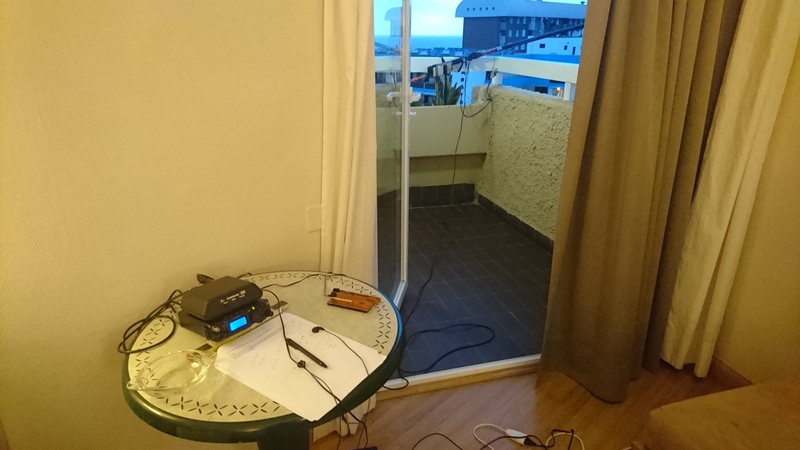 First attempt with the radio was in the evening of January 22. 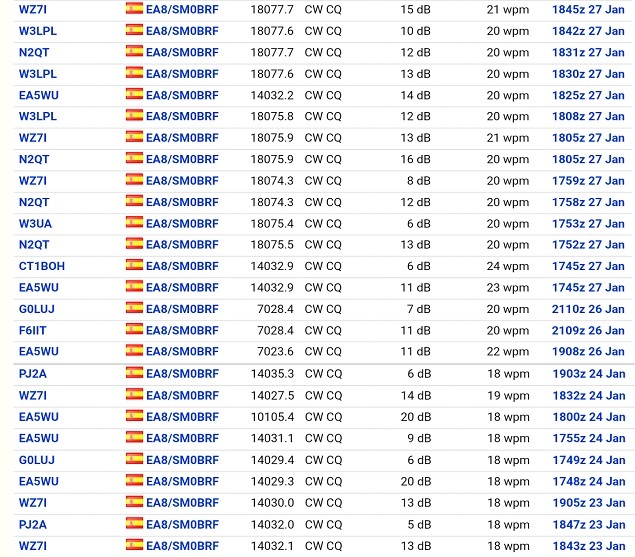 Not a single Reverse Beacon spot or QSO and heard signals were weak. 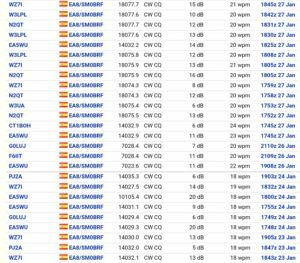 Next day there was a good signal from F6FJI and we had a QSO but signals dropped fast. Following days there were contacts with France, Spain and a few from the Caribbean. And the last contact was with N5KD in Dallas TX on 17 m.
During the day noise level was low but as soon lights were switched on in the street the noise was deafening, but with the 250 Hz filter it was S4 on the meter.